The Italian label will take us from music used for both sacred and secular pieces (with just a change of text), to the cusp of the Baroque, to a world premier look at an Italian Baroque master. I. Alma, svegliate ormai: Devotional Contrafacta in Italian Music during the Fifteenth and Sixteenth Centuries (Anonima Frottolisti) Tactus CD TC 400006. From Musica Dei Donum: The phenomenon of the contrafactum - the writing of new texts on pre-existing melodies - was quite common in the Middle Ages. In plainchant existing melodies were often used for texts which suited a new feast. A secular text could be replaced by lyrics of a sacred nature. In the 16th and early 17th centuries it was still a widespread practice. Several German hymns were given melodies which were originally set to a secular text. One of the most famous is O Haupt voll Blut und Wunden: Hans-Leo Hassler wrote this melody to a secular text, Mein Gmüt ist mir verwirret. The present disc focuses on contrafacta from the second half of the 15th and the first half of the 16th century as they were created in Italy. Most of these pieces were part of the repertoire of laudesi, fraternities founded in the 13th century. Laude were among the most disseminated pieces of the time and are technically not very complicated. The pieces on this disc are strophic and many have a refrain. These contrafacta also tell us which pieces were among the most popular. One of them was the chanson J'ay pris amour which appears in four tracks (12 to 15). First we hear the 'original' version; in this case that means a version with the original secular text, because as it is anonymous and exists in various versions it is impossible to say what the first version may have been. Next follows an instrumental version, taken from an edition published by Petrucci in Venice. This is followed by a contrafactum: the text is by Leonardo Giustinian, an Italian poet from the early 15th century: Madre che festi colui che te fece. The next track includes another instrumental piece from an edition by Petrucci which combines the melody of J'ay pris amours with another 'hit' of the renaissance: De tous bien plaine. The latter returns in the next three tracks: the chanson with the original secular text in a setting by Hayne de Ghizeghem, a contrafactum on a text by the poet Feo Belcari (1410-1484), Di tutto ben se' fonte, and lastly a piece from an edition by Petrucci which gives the composer or arranger as 'Franci'. In the list of sources the latter name is extended to Francigena but no further information is given. Here the melody of De tous bien plaine is used as the tenor. Another famous song from the renaissance - often used as the basis for a parody mass - is Fortuna desperata. First it is performed in a version attributed to Antoine Busnoys, then we hear a contrafactum from the pen of a certain Francesco degli Albizzi. Again the booklet doesn't provide us with any information about his identity. A search on the internet was not very fruitful: I only found the name "degli Albizzi" as the name of an aristocratic family from Florence. The author of the contrafactum performed here may have been a member of that family. It is one of various adaptations from his pen as the list of sources show. There is much uncertainty about who are responsible for the contrafacta recorded here; a number of them are anonymous. The track-list is not very helpful in that it makes no difference between composers and authors of texts. For that reason I have added the names between brackets after the titles. This disc includes both the originals and the adaptations. Some laude have the addition cantasi come: "to be sung like", with the title of the original piece. However, the titles which are given are sometimes hard to identify, some of the originals have been lost and a number of laude even come without any reference to the original. In such cases the performers had to look for music which could be used. "For instance, the laud Io son più perfida ingrata [track 21], with its metrical system and rhymes, and with the similarity of its lines, reminds us strongly of I' son più mal maritata [track 20] (...)", Emiliano Finucci writes in the liner-notes. A feature of contrafacta is that the music remains the same - probably except some very minor changes - but the text sometimes has to be adapted to the music or at least divided differently over the musical phrases. That is the case, for instance, if the original has fewer lines than the new text. It is interesting, for instance, to compare Fortuna desperata with Poi che t'ebi nel core. Otherwise the comparison between the original and the contrafactum is impossible as the lyrics - which have to be downloaded from the Tactus site - come without English translations. It would be interesting to compare the texts: is there any similarity in content or character? That is impossible to tell if one doesn't understand the meaning of the texts. The booklet omits any information about the way such laude as presented here were performed. Apart from four singers we hear various instruments: strings, wind and percussion. I am inclined to think that the relatively simple character of laude suggests a more modest line-up but I am ready to stand corrected. The performances as such are convincing and stylish; the singing and playing is generally very good. Only in some solo items the intonation is probably less than perfect. However, this is interesting repertoire which sheds light on an aspect of renaissance music which is not that well known. II. Sentirete una Canzonetta—Musical “Affetti” of the Renaissance and Baroque Period (In Taverna Musica). Tactus CD TV 580002. In practical terms, we might imagine we are taking a walk in a street of an Italian city, at the beginning of the seventeenth century. Our gaze and our attention are attracted by a series of musical objects that come from different backgrounds: each, in its own way, relates and represents a different possible interaction between man and music, between the needs of the former and the function of the latter. So the musical content of this CD presents a cross-section of the typical aesthetic features and diversified representative expressions that were most appreciated by the public during the late Renaissance and early Baroque. The idea of the opposition between thesis and antithesis became the driving force of an astonishing creativeness. Ciaccone, passacaglie, canzonette, villanelle and various dances were the synthesis of an ardent, sparkling musical and social energy. The style of the ensemble’s performance stems chiefly from the study of the iconographic sources, from which there emerges an artistic production that is targeted not exclusively at the educated class, but also, and above all, at the people: the practice of music was enjoyed in the streets, houses and taverns, and often depicted in joyful, sensual, lewd attitudes. Precisely in those places where there was no etiquette, music became an “art form” and a mirror of the period, perhaps in a more complete, genuine way than it did elsewhere. III. 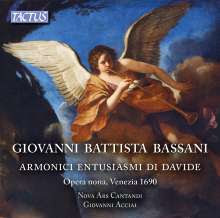 Giovanni Battista Bassani: Armonici Entusiasmi di Davide (Nova Ars Cantandi/Giovanni Acciai). Tactus CD TC 650290. Johannes Brochus, Antoine Busnoys, Francesco degli Albizzi, Feo Belcari (1410-1484) , Josquin d’Ascanio, Bernardo Giambullari, Leonardo Giustinian , Hayne van Ghizeghem, Franci, Angelo Poliziano, Castellano Castellani , Bartolomeo Tromboncino, Enrico Radesca di Foggia (sec. XVI-1625), Giuseppino del Biado (sec. XVII), Andrea Falconieri (1585 ca.-1656), Giovanni Felice Sances (1600-1679), Girolamo Frescobaldi (1583-1643), Tommaso Pace da Perugia (sec. XVII), Vincenzo Calestani (1589-p. 1617), Tarquinio Merula (1595 ca.-1665), Pellegrino Possenti (sec. XVII), Giorgio Mainerio (1535 ca.-1582), Claudio Monteverdi (1567-1643), Giovanni Battista Bassani. CD TC 400006, CD TV 580002, CD TC 650290.